I woke up at 6 to gray cool Seattle skies, yay, so much more pleasant than the recent 90 degree days... and drowsed, then finally wandered downstairs in search of caffeine and to say goodbye and thanks to Brian before he left at 6:30. Carrie was reading the paper on the dining room trail, and said Brian had already left. Crap--sorry Brian for not saying goodbye and much thanks in person. Your family and house really did help out when I was in a bit of a bind. Today was just "get to Chelan", which involved a few busses so I can sleep overnight and get on the morning ferry. I took the first 70-series bus (a 72X) to the I-district and got there very early, right at 8, with time to kill, so I wandered into a Peets next to the station, shunning Starbucks next door, and while my mocha was being made I went to use the Peets restroom in the lobby of office building while my mocha was made. The security guard said "sorry, closed for cleaning, it'll be open in ten minutes", so I hung out at Peets for 20 minutes, then went back to use the restroom, and a different security guard said "Sorry, closed for cleaning, it'll be open in ten minutes." I guess with my backpack and scraggly beard I fit right in with the hundreds of homeless wandering around downtown Seattle looking for a bathroom to use (ie, to shoot up or wash up or do anything but pee). I just wanted to pee, so I said "Uh huh" and went over to the bus/train station to find the restroom. In the train station, yet another security guard trailed me into the restroom, but when I headed for the urinals and not the sink he turned around. The sink was a clever anti-homeless design, too, no basins but rather a long sloped trough for the water to drain from each of the three faucets. The bus was a bit late, and I chatted with Karl and Randy, two guys in their 20s who loved playing bush league baseball and who were heading up the PCT from Stevens Pass to visit Randy's parents, who were stationed at a fire lookout west of Glacier Peak. It was a great little chat about water and camping and fires. They didn't quite know about Halfmile's app for the PCT, so Randy put it on his iPhone and got engrossed. I got to talking about my detour on the PCT, and they thought I made the right move: while I could get out the Suiattle River Trail, there won't be much traffic on it, and there certainly won't be many hikers on it now, with wildfire just up the trail and smoke blowing through the valleys. Randy did point out an alternative north of Stehekin as well, should wildfires close any part of the PCT between High Bridge (a few miles north of Stehekin) and Highway 20. That alternative is just to head directly north up Rainbow Creek, over McAlester Pass, and then straight ahead to the Highway 20, which the PCT crosses just a couple of miles away to the west. Randy said that hike is a bit steep and brutal, but doable. The regular PCT route, which I'll take if it's open, is much more mellow (for once! ), and follows the river valley in a big C shape to Highway 20. Now, that Northwest Trailways bus we were on from Seattle to Wenatchee isn't the fastest, but it does get the job done--after stops in Everett and Monroe and Stevens Pass, there was a longer break at a gas station down valley, a short stop in Leavenworth,. The scenery changed from forest to that dry steppe desert of eastern Washington, and the highway followed the Wenatchee River, and I spotted several large salmon swimming in the clear jade water. Wenatchee was cute and charming, surprisingly, and I had a hankering for pizza with apples on it. 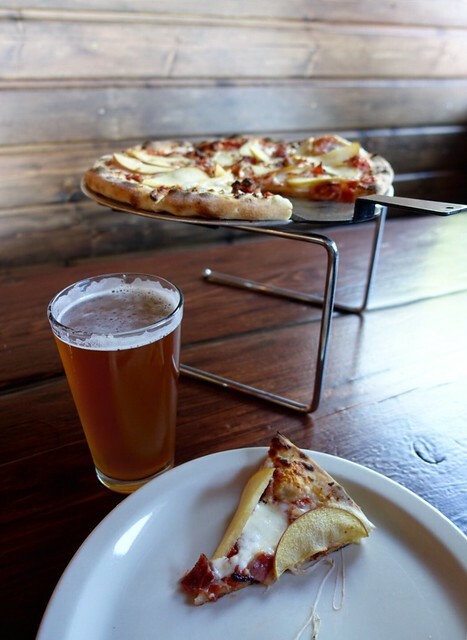 Pizza with apples and bacon, Wenatchee. Wenatchee is a big regional city, bigger than I thought (it has a Costco, for instance), and I thought about why its known for apples. Sure, the climate is very similar to where apples are native--Kazakhstan--but there's got to be something else. Passing those huge cold storage warehouses for keeping apples gave me a bit of a clue; those take a lot of electricity. 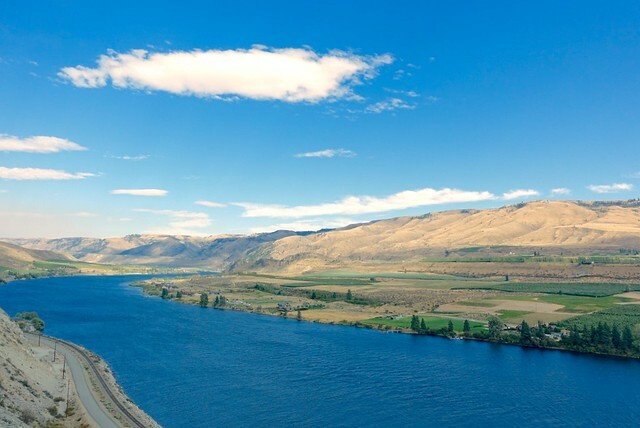 I figured that all that cheap hydropower from the Columbia River made it possible, along with refrigeration, and good barge and rail connections to the eastern US and Pacific Port, so apples can be stored and released year-round and not just for a few months in the fall. Nowadays that cheap electricity is more attractive for a different type of farming... those server farms popping up in places like Quincy and Boardman and Prineville, serving Microsoft and Amazon and Facebook..
After pizza, it was time to figure out the local bus system--not too hard--and I hopped on the 21 for the 45 minute ride along the Columbia River to Chelan. That was pleasant, and man is that river wide. Tomorrow is the ferry ride to Stehekin, then five days of walking to Canada... then I'm finished (but not done, as it were.) And it'll be time to get on with things too; I can already feel post-PCT thoughts occupying more and more of my headspace time. I'll enjoy the scenery, but it's really feeling like its time to get on with things.